SOUTH BEND, Ind. 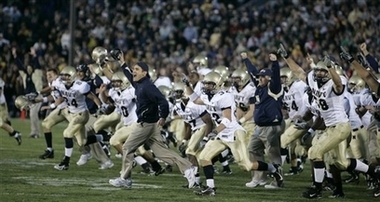 – It took 44 years and three overtimes for Navy to beat Notre Dame. The Midshipmen snapped an NCAA-record 43-game losing streak to the Fighting Irish on Saturday with a 46-44 victory in triple overtime. Kaipo-Noa Kaheaku-Enhada threw a 25-yard TD pass to Reggie Campbell on the first play of the third overtime, then found him again in the end zone for the 2-point conversion. Notre Dame cut the lead to two on a 5-yard TD run by Travis Thomas. But after a pass interference call gave Notre Dame a second-chance at the 2-point conversion, defensive lineman Michael Walsh and linebacker Irv Spencer tackled Thomas well short of the end zone. It was the first time Navy (5-4) beat Notre Dame since a 35-14 win in 1963 when Roger Staubach was quarterback for the Midshipmen. The Midshipmen celebrated the long-awaited victory at midfield, jumping on top of each other. For Notre Dame (1-8) it was its school-record fifth straight home loss, another low point in a season of lows. 1- The pass interference on the first two-point try by Notre Dame was a bad call. Navy kept their cool and recovered. 2- NBC was commercial happy during the last minutes of the 4th quarter. One play, one commercial break. I’d like some football with my commercials. 3- Is Charlie Weis’ job in danger? Tyrone Willingham was never 1-8, but he was shown the door.